Remembering to explore our own backyard is a very important aspect of our travel lives. Every metro area around the country has its own hidden gems that can be missed if we only look at travel with the narrow paintbrush of having to step on a plane to discover something new. Up until the last couple of years I have been a criminal when it comes to this law of travel. Exploring the greater Omaha area these past few years has introduced me to some wonderful restaurants, breweries, outdoor spaces, and areas of town that I had once ignored in a quest to see as much of the world outside of the area that I have called home for 11 years. One of the areas that I had never ventured to until recently is the “Old Towne” area of Bellevue, NE. 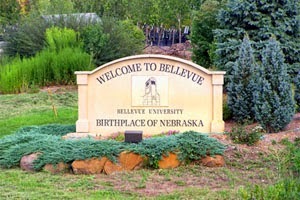 Bellevue is the oldest city in Nebraska (take that Omaha) and it’s Old Towne, as the name suggests, is the original neighborhood of this city on the river. Old town Bellevue is an area of quirky shops, fun restaurants, cafes, and theatres surrounded by tree lined streets. When visiting the Omaha area (or if you live in Omaha), Old Towne Bellevue is a quick drive for some shopping or a starting point for a Missouri River fall foliage drive. One thing that sets this suburban downtown apart from the rest though, is its local meadery. So I tossed the word out there, but what the heck is a meadery? It’s a place to make mead of course. Real mead by definition is liquor distilled with only honey, water, and yeast. The alcohol is only derived from the sugar in the honey, no grains or grapes can be fermented for true mead. Flavors can be added after the mead is fermented to come up with flavored mead, but at its base, the alcohol content in mead can only come from honey. Lucky for me I absolutely HATE honey. Wait, what? Who hates honey? This guy dislikes honey to its core. It’s just so sweet, and the whole consistency where it kind of hangs off a spoon, and the color of it where it’s kind of transparent but not…yuck. Maybe for Pooh Bear, but no honey for this guy. But as I planned my trip to Bellevue’s Moonstruck Meadery, I was assured that I wouldn’t even taste the honey. Moonstruck Meadery has been in operation in Bellevue for 3 years. The name “Moonstruck” was derived from the Moonstruck Super Moon of 2011, the same year the meadery was opened. As with most of the craft breweries and distilleries we visit, the founder of Moonstruck was a home brewer of mead before taking mead to the masses. All of the operations of Moonstruck Meadery are in Bellevue in 2 locations, one operates as the distillery and bottling house and the other (where we visited) operates as the tasting room. At any time there are 10 different meads available for bottle purchase (either online in 19 states or from retail liquor stores in Nebraska and Iowa) or for tasting in the mead capital of the heartland, Bellevue. By now everyone knows that we choose straight from the source every time for the atmosphere and the always willing staff to give us the proud story of their craft. As I entered the meadery my eyes turned to the big sign that read “Honey”. By this point I had read up on everything mead. Did you know it is considered to be one of the oldest forms of alcohol on earth? I was ready for whatever this drink from the bees had to offer, aversion to honey be damned. The setting was very comfortable with a nice bar area and seating for food and mead tasting (Moonstruck also specializes in homemade pizza). As I grabbed my seat the attentive and overly knowledgeable staff answered all of my questions and prepared a flight of 6 meads for me. I would be set up with the Show Mead (original honey with no other flavors added), Cherry Melomel (any mead with fruit added is a Melomel), Apple Cyser (apples and spices for a more fall flavored mead), Peach Melomel, Hoppy Mead (German hops added to the Show Mead) and the world double gold medal winner Capsumel (mead blended with Serrano, Anaheim, and Jalapeno peppers). Mead Taps! Can we do mead keg stands? The flight of mead at my table looked like a flight of wine, which is how the mead bottles appeared as well but it is surely not wine. I lifted my first glass (the Show Mead), remembered how much I do like Pooh Bear, and took my first drink of mead. To say I was stunned by the taste would be an understatement. As described above, Show Mead is not an overly complex blend of ingredients (honey, water, yeast). What I tasted was neither overly sweet nor dull. The Show Mead was pleasantly smooth with little dryness. It was actually very crisp, had no bitterness at all, and won me over for the other flavors I would be tasting. I moved on to the fruit meads after I finished my Show Mead, no need to mix and match and play with flavors. The peach, apple, and cherry all had wonderful flavors of the fruits that were added to flavor the respective mead variations. As I learned from the meadery, all of these flavors are added after fermentation to keep the consistency of the alcohol true to its honey roots. I enjoyed all 3 of the fruit meads,but really liked the Apple Cyser as it has the added holiday spices. I could very much envision heating some up for the holidays. From the fruits I moved on to the Hoppy Mead and finished off with the Capsumel. The Hoppy mead intrigued me as a craft beer drinker. I was told that Cascade and Hallertau hops are dry hopped into the mead, again after fermentation. The hops added a real citrus flavor and some bitterness to the sweet mead, something I didn’t expect but enjoyed. The Capsumel, or pepper mead, was the gold standard for Moonstruck Meadery that I highly anticipated trying so I saved it for the end. For 2 years running it has won gold medals overseas, the only mead to ever have pulled off that accomplishment. In my life I have had chili beer before, but the Capsumel was a whole different experience. It had an aroma of a fresh pepper garden and a taste all of its. The mead was so fresh that I swore I could taste the individual jalapeno seeds. It had some heat, but it wasn’t overwhelming for people with aversions to spicy food. Of all tried this was my favorite mead, not just because of the status of the mead, but also because of the uniqueness of the flavors in the glass. I not only survived my encounter with a spirit made from honey, but I thoroughly enjoyed it. Though mead is produced at some wineries, the mead from Moonstruck is the only mead in a large part of the Midwest made the proper way and the folks at Moonstruck are very proud of that. Mead is not wine, but if you like wine you would be well served to try some real mead. The craft of turning honey (local Nebraska honey) into a tasty alcohol that even a honey hater enjoys is alive and well in Bellevue, NE. Come celebrate bees in the Heartland with us, Winnie the Pooh and I will show you the way.